Alfa Romeo have lacked a saloon in the competitive 2-litre class since the 2000. 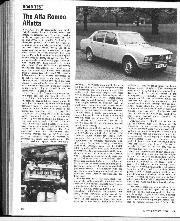 The most prestigious saloon they could muster was the Alfetta with 1.6 or 1.8-litre engine, a shade close in competition to the new Giuli- etta, which should be on sale in Britain in 1.6-litre form very soon. As expected, Alfa have now upgraded the four-door Alfetta by dropping in the 2-litre version of the famous all-aluminium, twin overhead camshaft, straight-four engine. The benefit is slight in terms of extra performance and puts the Alfetta 2.0 in a higher tax bracket for those who must pay the Inland Revenue for the privilege of having a company car. More important than the engine change are concurrent improvements in styling, space utilisation, appointments and suspension. The result is a compact, high performance, four- door, sophisticated saloon with endearing, sporting driving characteristics. It carries the prestige of the Alfa badge and all the engineering delights which go with it, yet wrapped in a pleasingly conservative package. In the four years since I gave the early Alfetta 1.8 a fairly lukewarm reception in my Motor Sport road test, the model has matured considerably. I found myself bubbling with enthusiasm for this latest version, excellent value at £4,799. The 2.0 is identifiable by its two rectangular, halogen headlights in place of four round ones, modified stainless steel bumpers with polyurethane protectors, and redesigned rear lights, while the slightly longer tail gives a touch better balance to the gentle wedge shape. All the 4,385 mm. increase in length is reflected in increased boot space, which is generous indeed at 21 cu. ft. Other details include flush-fitting, push-button door handles and extended air-outlet grilles in the rear quarter panels. The interior has been completely redesigned, with a new facia, seats and steering wheel. Rear seat passengers benefit from 7 cm. more legroom and 2 cm. headroom, achieved by increasing the rake of the back rest, and foot rests are an added luxury. 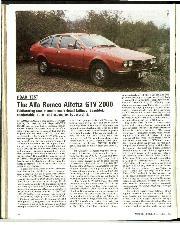 This saloon shares the same engine as the GTV 2000 coupe, another Alfa Romeo which we rated highly in Motor Sport. In its latest European emission guise this big- hearted aluminium “four”, with its twin, chain-driven camshafts and two, twin-choke, side draught Dell’Orto carburetters gives 122 b.h.p. DIN at 5,300 r.p.m. and 129 lb. ft. torque at 4,400 r.p.m. Its 1,962 c.c. is obtained from a bore of 84 mm., 4 mm. up on the 1,779-c.c. engine of the old Alfetta 1.8, and an 88.5 mm. stroke. With a compression ratio of 9 to 1, the five-bearing engine, with nitrided crankshaft, hemispherical combustion chambers and finned, aluminium sump demands four-star fuel. 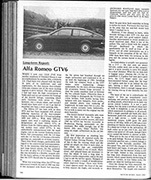 The traditional crispness of the Alfa engine is allied in this new Alfetta to the sophisticated front engine/rear transaxle arrangement which is common now to all the revised range of Alfa Nord products, save for the Farinabodied Spider (still in production for some European countries but, alas, not for Britain). The transaxle unit containing the five-speed gearbox, clutch and differential is Silentbloc- mounted to two body cross-members and driven by a two-piece propshaft. 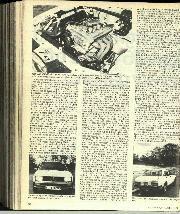 Last time we remarked about the antecedents of this type of front engine/rear wheel drive, optimum weight distribution layout we had a spate of letters saying, “but you didn’t mention so- and-so”. This time I’ll add one of my own: the Maserati 300S, personally significant because I am writing these road impressions in a Le Mans hotel bedroom after racing a 300S in the Le Mans historic race. 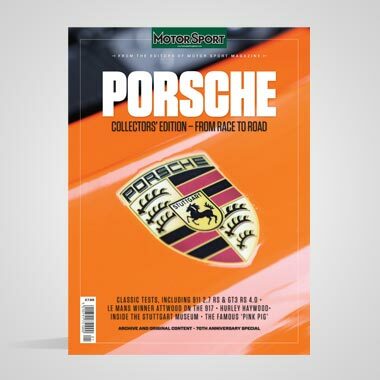 Hopefully, if I catch up with my schedule, a story on the car and the race should appear elsewhere in this issue. Like the famous sports racing Maserati, the Alfetta 2000 uses De Dion rear suspension as a means of reducing unsprung weight while keeping the wheels vertical and the tyre contact area constant. The De Dion tube is triangulated by a pair of stout longitudinal struts connected to a forward body cross-member. Lateral location is by means of a Watts linkage, pivoting on the centre of the tube. The arrangement is completed by coil springs, telescopic shock-absorbers and an anti-roll bar. The 9.84 in. diameter rear disc brakes are mounted inboard, where the handbrake operates on the main pads. Torsion bar, wishbone front suspension has telescopic shock-absorbers and an anti-roll bar. Alfa Nord ventured into rack and pinion steering with the Alfetta 1.8 and this is retained, along with outboard disc brakes. Underbonnet accessibility has been im- proved now the bonnet hinges have been moved to the rear, although the bonnet release was almost impossibly stiff on the test car. I was pleased to see that the dip-stick is accessible on the left of the engine instead of hidden under the distributor as on my Spider. This new Alfetta’s heating system is a triumph of over-complexity. No less than eleven adjustable and swivelling ventilation, demisting and heating outlets pock-mark the facia and under-facia. Goodness knows what they are all supposed to do: in spite of following the handbook to the letter I found it difficult to direct warm air on to the feet or to find the right mix of heating and ventilation. Eventually the temperature would even out comfortably, but the system would not be up to rapid thawing out of frozen feet in the Italian Alps. The temperature control lever acts on a thermostat which is supposed to keep the air temperature constant and when set to maximum automatically switches on the electric fan, its three speeds also operable by a separate switch. I am not sure whether much Alfa motoring over the intervening years has moulded my body to fit, or whether the driving position really has been improved since the early Alfetta. Whatever, I found the 2000 a com­fortable car to drive and the new front seats particularly good. Of all my colleagues who drove the test car, only a 6 ft. 3 in. ad. man complained about comfort. The steering column is adjustable for rake but not for reach and the driver's seat does not have the clever height adjustment of the GTV 2000. A new steering wheel has a padded rim and a horn push in each of its three spokes. Pedals are ideally spaced and there is a generously-sized rest for the left foot. 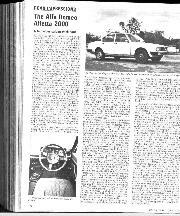 If the front seat belts fitted to the test car were representative, I am surprised that the Alfetta 2000 complies with European regula­tions. Marked "Sabet, made in Torino" on one side and "Britax" on the other, these inertia belts became trapped and twisted in the guide loops on the centre pillars and had begun to fray in a few thousand miles. In short, they were useless. If this is the norm, Alfa Romeo must do something about it. Some road-test cars are so pallid that all the little niggles overshadow the impression behind the wheel. The Alfetta 2000 1s such an inspiring, lively and delightful car to drive that any grunts and gripes are instantly forgiven once its wheels are turning. This Alfa Romeo has more soul than any other medium-sized family saloon-which is what it is, in spite of its pedigree and sporting flavour. The traditional matched hand throttle and choke under the facia can be ignored for cold starting: a few priming pumps on the throttle suffice to inject life when the key is turned. Within half a minute the twin-cam crackle becomes clean and smooth. To move the golf-club-shaped lever into first or second when the transaxle is cold remains a crunchy affair and even when warm it pays to ease the lever gently into first from rest, for the synchro will baulk at violence. Otherwise the gearchange, through its long linkage to the back of the car, is much improved, even since the GTV 2000 test car of late 1976. There is strong spring bias into the third/fourth plane and the linkages are a little bit sloppy and noisy, but the change itself is now accurate, easy and free from baulking, except from rest. It is allied to five beautifully spaced ratios, of which the 0.83-to-1 fifth is an "all-times" gear rather than an overdrive, thanks to the low 4.1-to-1 final drive ratio. Such a comparatively low final drive means that the speeds in the gears are low too (an indicated 31, 51, 75 m.p.h. and 100 m.p.h. at the 5,650-r.p.m. red line) so a fair amount of gearchanging is necessary at modest speeds. This has always been the case with, and, perhaps curiously, part of the charm of, Alfa Romeos because of the sweetness of engine and gear ratios. On the other hand, the engine is so flexible that it will run down to 1,000 r.p.m. without protest and can be popped straight from second to fourth or third to fifth if the driver is in a lazy mood, treatment which the heavier saloon took as happily as my lighter Spider. The response in the lower ratios is ideal for tackling London traffic with an alacrity which I doubt any comparably sized saloon can match. In its noise levels, this Alfetta comes near to being all things to all men. 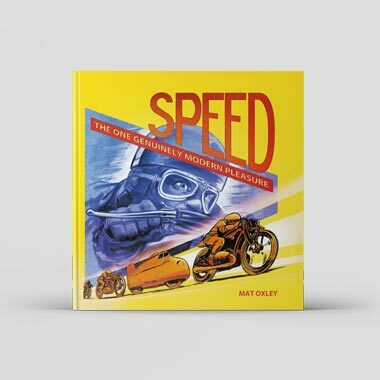 The enthusiast will delight in the crisp, urgent crackle as the throttles are opened, yet the level is not high enough to be offensive to sensitive ears. On a steady throttle the noise from the lovely straight-four is remarkably muted, while suspension and road noise insulation is first class, better, I think, than in the GTV 2000. Wind noise is moderate. The combination of noise suppression, happy gearing, stability and good high-speed ride ensures that the Alfetta 2000 retains that magical, even mysterious Alfa Romeo capability of making three-figure cruising speeds feel like 60 m.p.h. Alfa Romeo claim a 114-m.p.h. 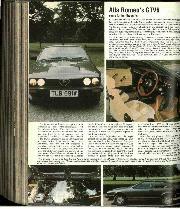 maximum: the test car proved capable of hanging on to a friend's 3-litre Capri, out of the slipstream, with both cars indicating 121 m.p.h., a genuine 116/117. Fuel consumption varied from 20-21 m.p.g. commuting into London to 26-27 m.p.g. on a long run. The tank holds 10.9 gallons. Excellent balance and roadholding, even on modestly dimensioned 165 HR 14 Michelin XAS's, have removed some of the tail-happy handling sparkle for which earlier Alfas were renowned. The truth is that the Alfetta's handling and roadholding is much more efficient and cornering speeds much higher. The chassis behaviour has been much im­proved since the earlier Alfettas and this 2000 version has stiffer torsion bars and a thinner anti-roll bar at the front. 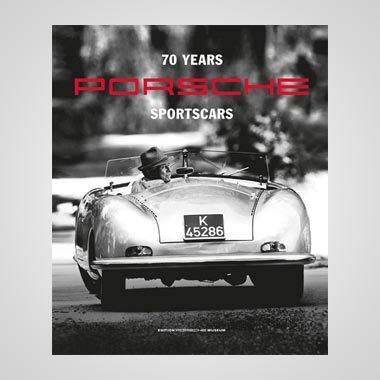 Its suspension is comparatively soft yet welJ damped, its vice­free handling tending towards understeer at modest speeds, simply growing more neutral as speed increases. It is almost impossible to lose grip at either end in the dry, even with deliberate provocation. 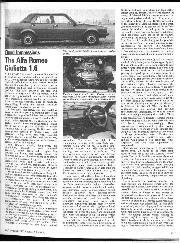 Nevertheless new­comers to Alfa motoring might feel the Alfetta to be a Ii ttle nervous; all Al fas feel to have this means of communication with the driver, who soon learns the code. Indeed, the Alfetta 2000 · is the most forgiving of cars. The tail can be made to break away in the wet, but correction is easy, albeit accompanied by a lurch as the car regains its straight-ahead posture, just like the road test Alfetta of I 974. The rack and pinion steering is a little more rubbery than that of some Alfas, yet still smooth and communicative, if a bit heavy at low speeds. Presumably because of different weight distribution, traction is not so good as that of the GTV 2000, although still far superior to BMW, Dolomite Sprint et al. On the other hand the comfortable ride is much better, less choppy than that of the GTV. The scintillating performance and handling is matched by brakes which put other medium­sized cars to shame. Initially, I thought them a little bit over-servoed in comparison with other Alfas, but soon found them as progres­sive and impressive as ever. I have complained about Alf Romeo paint a finish in the past; the test car showed a great improvement, the paint much tougher. Service intervals are 12,000 miles, although personal experience would suggest 8,000 miles to be more sensible. Any plainness in this Alfa package is more than made up for by its inherent mechanical character. With such excellent, lively, sporting characteristics, four doors and five seats, it is hard to beat at any price. - C.R.